You’ve arrived at the home of Ministry Today, a journal for those in Christian leadership. Ministry Today UK is a journal for those in Christian leadership published in hard copy three times per year. This website gives open access to the contents of all but the last three editions of Ministry Today UK. These last three editions are only fully available to subscribers. For details of how to subscribe, see our Subscriptions section. All other previous editions can be accessed through this website. You can use the Search facility at the top of this and every page to search for any reference to any subject covered by articles in all previous editions of Ministry Today UK. 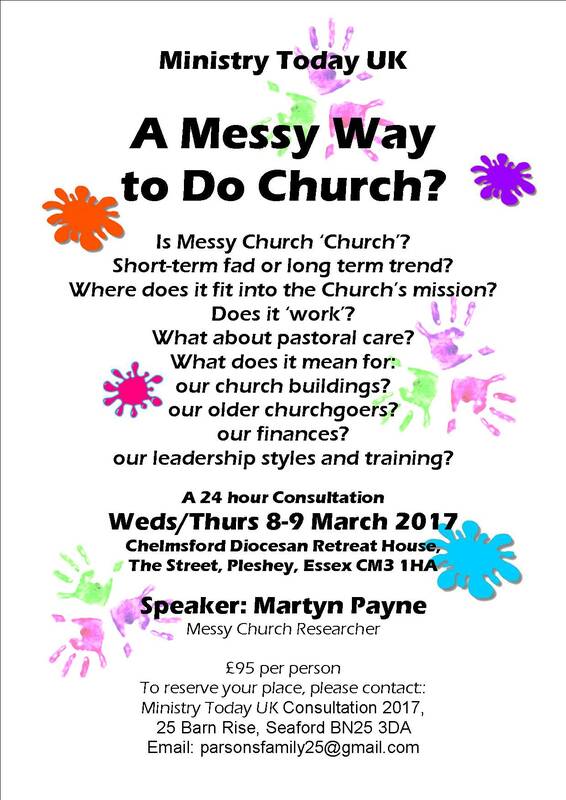 Is Messy Church ‘Church’? Short-term fad or long-term trend? Where does it fit into the Church’s mission? Does it ‘work’? What about pastoral care? What does it mean for: our church buildings? our older churchgoers? our finances? our leadership styles and training? Ministry Today is hosting a 24 hour consultation from 8th-9th March 2017 at the Chelmsford Diocesan Retreat House. Why not join us? More details are available here. This is the latest entry in Church Matters, a blog by our General Editor, Paul Beasley-Murray.